Hubert von Herkomer was born in Germany in 1849. Hubert's family to England and in 1857 settled in Southampton. Herkomer studied at Southampton School of Art, the Munich Academy and the South Kensington Art School, where like his fellow student Luke Fildes, he was influenced by the work of Frederick Walker. Herkomer left Kensington Art School and 1867 and started a career as a book and magazine illustrator. Herkomer found most of the work fairly boring but as a young man with radical political opinions he was excited by the news that the social reformer, William Luson Thomas, planned to publish an illustrated weekly magazine called the Graphic magazine. Herkomer sent Thomas a drawing of a group of gypsies. Thomas accepted the picture and the following week it appeared in the Graphic. Herkomer was paid £8 for the picture and Thomas urged him to send more. Herkomer later recalled: " It is not too much to say that there was a visible change in the selection of subjects by painters in England after the advent of The Graphic. Mr. Thomas opened its pages to every phase of the story of our life; he led the rising artist into drawing subjects that might never have otherwise arrested his attention; he only asked that they should be subjects of universal interest and of artistic value." Over the next few years Herkomer had a large number of his drawings published in the Graphic. However, unlike his two friends, Luke Fildes and Frank Holl, Herkomer was not offered a full-time post on the magazine. Where as staff members were commissioned, free-lance artists such as Herkomer had to find his own subject matter. Although Herkomer was angry when William Luson Thomas told him he was unwilling to employ him as a staff member of the Graphic, he later admitted: "In my heart I bitterly resented these words, but they were the words I needed: they were the making of me as an artist.". Several of Herkomer's engravings that appeared in the Graphic were later reworked as large-scale oil paintings. This included, The Last Muster (1875) and Eventide: A Scene in the Westminster Union (1878). The Last Muster had originally been used by the Graphic to show a group of old army veterans attending a church service. As a painting it was seven feet long and was sold to a photographic firm for £1,200. In 1880s Hubert von Herkomer concentrated on the financially lucrative area of portraiture. He visited the USA and during a period of ten weeks received £6,600 for thirteen portraits. 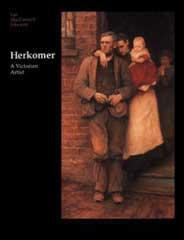 Herkomer's income was now higher than many of the rich people he painted and was now able to live a life of luxury. Although he received large sums of money for his portraits, Herkomer continued to produce social realist paintings. This included the Pressing to the West (1884), Hard Times (1885) and On Strike (1891). 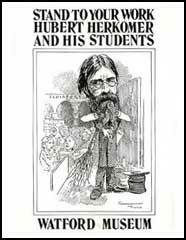 Herkomer opened his own art school and during the period 1883 and 1904, trained over 500 students. Herkomer also served as Slade Professor of Art between 1885 and 1895. Hubert von Herkomer, who was knighted in 1907, died in 1914. (1) On the death of William Luson Thomas, Hubert von Herkomer wrote an account of the importance of the Graphic to social realist artists. It is not too much to say that there was a visible change in the selection of subjects by painters in England after the advent of The Graphic. Mr. Thomas opened its pages to every phase of the story of our life; he led the rising artist into drawing subjects that might never have otherwise arrested his attention; he only asked that they should be subjects of universal interest and of artistic value. I owe to Mr. Thomas everything in my early art career. Whether it was to do a twopenny lodging-house for women in St. Giles', a scene in Petticoat Lane, Sunday morning, the flogging of a criminal in Newgate Prison, an entertainment given to Italian organ grinders, it mattered little. It was a lesson in life, and a lesson in art. I am only one of many who received these lessons at the hands of Mr. W. L. Thomas. I have three sitters every day. It seems like a dream that I can with my own honest handiwork make so much. In the two and a half months I shall have done thirteen portraits for money. These thirteen portraits bring me six thousand six hundred and fourteen pounds sterling. I have already paid into my bank this year five thousand pounds, so I shall have in the nine months of this year over eleven thousand. Everybody wants to be painted now. Whenever I come to Boston again a clear year's work is ready for me. This is not a wild speculation but a reality.